The activities are supported by Manchester City Council and the VLBA. Donations recived by the PaSH Partnership will be shared equally between the PaSH Partners to support services for people newly diagnosed with HIV, living longer-term with HIV or those most at risk of acquiring HIV. Friday 30th November and Saturday 1st December. PaSH partnership volunteers will be fundraising and offering ribbons & ‘5 Facts about HIV’ cards in Manchester City Centre during the day on Friday 30th November and Saturday 1st December. To commemorate the 30th World AIDS Day, the PaSH Partnership is aiming to deliver a very special Vigil. The Vigil will start at 7pm in Sackville Gardens. PaSH Partnership volunteers will be offering candles and ribbons from 5.30pm in the area around Sackville Gardens. 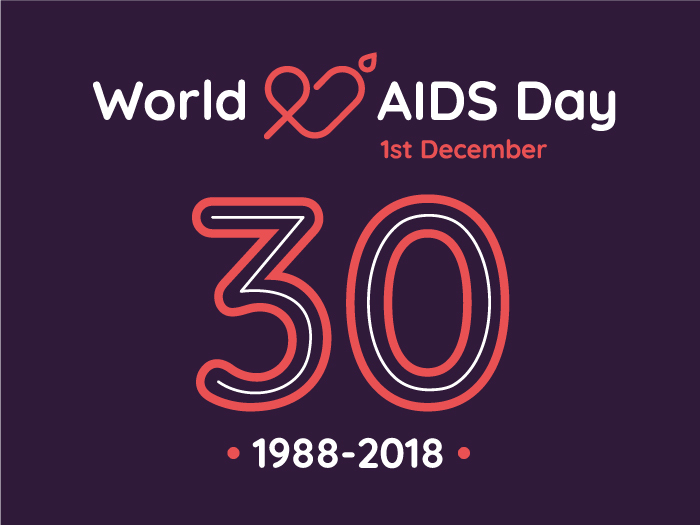 The Vigil will be opened by a Founding Father of Manchester AIDSline, acknowledging 30 years of World AIDS Day, HIV activism then-and-now and the messages that are so important today. Positive Speakers will reiterate messages and introduce the Procession, where remembrance will take to the street. ’10 voices’ will reflect a global perspective. The National Transgender Memorial will be illuminated for the service. Manchester Lesbian and Gay Chorus and the Women Asylum Seekers Together Choir will sing. The Vigil will close at around 8pm. The Village Candlelit Procession is an established and important element of the Manchester World AIDS day commemoration. To mark the 30th World AIDS day, the procession will feature 30 placards. Each placard will feature the words depicted on one of the plaques on the Beacon of Hope timeline 1988 – 2018. These placards will display a very powerful timeline of HIV over 30 years and each placard will be carried by a staff member or other representative from Village businesses as testament to the Village’s response to the early days of the epidemic and its continued support to this day. As the Procession returns to the park, the placard bearers will be asked to stand at each side of the stage for the second part of the service. Weather-permitting, the Procession will lead off with PaSH Partnership volunteers carrying a quilt from the UK AIDS Memorial Quilt. The quilts are a remarkable and irreplaceable piece of social history, it tells the stories of many of those lost in the early days of the HIV AIDS epidemic in the 1980’s and 1990’s and each quilt is made of up to eight embroidered panels, lovingly made in memory of friends, family and lovers lost to HIV. The quilt in the Procession includes a panel in memory of David Walburn, a volunteer at Manchester AIDSline (now George House Trust) and a founder Trustee of Body Positive North West. The volunteers will stop at the end of Canal Street so that everyone taking part can see the Quilt as they walk by. Village business staff and customers light candles and stand outside their venues as the Procession passes by and this makes the occasion even more poignant. In total there are 48 12ft by 12ft panels, each comprising up to eight smaller panels. Each panel is approximately 4msq. Each individual panel commemorates someone who died of AIDS and has been lovingly made by their friends, lovers or family. At the heart of the Vigil is the Beacon of Hope, the UK’s only permanent memorial to those lost to HIV. The Beacon also stands as a symbol of solidarity with those living with HIV today. A series of plaques at the Beacon, one for each year, create a moving and powerful timeline of local, National and Global developments and landmarks since the early days of the HIV epidemic. To commemorate the 30th Anniversary of World AIDS day George House Trust, as part of, and on behalf of the PaSH Partnership will publish each day throughout November the text depicted on each of these plaques as a reminder of how the epidemic attacked, took hold, progressed and has been fought over the last 30 years.